Calling all parents and caregivers! The Family Resource Fair is a free, community event for families with children (infants through elementary school). 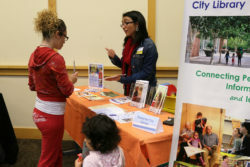 The Family Resource Fair features engaging displays, activities for children and information for adults from over 20 local nonprofit organizations. Exhibits highlight a wide range of topics including children’s healthcare, educational support for kids of all abilities, nutritional services, fine arts, mentoring and more. Kids play while learning about everything from healthy eating to local recreation activities to bicycle safety. ← Beaverton Library Foundation celebrates Summer Reading!